You squirm and say, 'It's the thought that counts' when confronted with an odd, unwanted present - don't you? Yes. It's the gracious retort. The best way to avoid hearing that yourself is to give delicious homemade gifts. They never get that uncomfortable response. You see, while it is nice to make a gesture, I've seen that the thought is not in the giving, but in the thoughtful choice or in the preparation of the gift. A delectable present you've made yourself will usually be received with a "Oh yum! Thanks!" So every year I cook and bake Christmas gifts. I do it because it comes from the heart. It's more personal, a piece of me going to those that I cherish. The gifts are unique a very special Christmas gift. Homemade gifts can also save money, so the difference of what I might save by not buying my gifts, goes to charity so that I share my good fortune beyond my loved ones. This post coincides with my hope to raise awareness for Mission Australia, a charity who is very active in Australian communities. They help disadvantaged families, grandparents who have primary care of their grandchildren, the homeless. They also do great work to assist young people to stay at school or deal with drug and alcohol dependency. Basically they give a caring hand and untiring support to those less fortunate than ourselves. I have written this post as part of 'Bake a Difference' - a promotion sponsored by CSR Sugar to raise awareness for Mission Australia. It's their aim to encourage all of us to spare some money for the cause. In return for a donation to the Bake a Difference fundraiser, CSR will match our donations doubling the money raised. Bloggers can join in to raise awareness by posting a recipe and registering via Penny's Jeroxie blog. CSR will send each participant who registers, a special thank you pack. I strongly urge everyone to share their good fortune by pledging some money to Bake a Difference. Even a small amount will make a difference to someone, especially as it will be doubled by CSR. While naturally I support their idea that we should give homemade gifts and save money in order to donate, you needn't bake. The important thing is to share the joy by donating. And CSR have popped a gift tag generator on their donation site, which could save you even more money this year, whilst letting others know that you are supporting Mission Australia. If you're looking for ideas, some of the homemade gifts I have made in the past have included little jars of creamy free range egg mayonnaise, dijonnaise, vinaigrette, ginger and macadamia brownies, tomato relish, lemon oil, orange shortbread, window biscuit decorations, mini Christmas cakes, choc-nut clusters and mini buckets of mixed cookies. Just choose something that you can make in bulk that's simple to do. You'll find that there are a bunch of suggestions on the CSR website and Facebook page. When it's homemade, your gifts needn't be large and the packaging of it generally doesn't require much wrapping. I reuse old jars, pack sweet things in glasses bought at the $2 shop or find quirky containers - that I then wrap simply in plain cellophane. I use baskets found in op shops or buy coloured paper takeaway containers at Spotlight. All they need is to be tied with a ribbon and a gift tag. They look cute and I love that by avoiding wrapping paper, I save a few trees in the process. While homemade will save you money, it is also better for the planet. These days items that are handcrafted have become the new status symbols, as each piece is unique. My gifts are always enjoyed and usually gobbled down quickly. The one's I've to given colleagues have rarely made it home, as they are munched over the course of the working day. So this year, instead of wearing yourself out, frustratingly shopping for gifts by traipsing around malls, spend half a day in the kitchen making something with love. Have a heart and spread the word about Mission Australia. Please spare them some money and treat your loved ones to a personally made gift. Preheat oven to 180 degrees centigrade. If you're using a traditional pan, grease and line with silicon baking paper. Melt chocolate until smooth in a bowl suspended over a simmering saucepan of water. If the melted chocolate is a bit stiff - and not runny - stir in a teaspoon of warm water to loosen it. Cream butter and sugar then add the chocolate and the egg to make a rich batter. Then sift in the flour and the cocoa and stir them in well. Press the chocolate mix into your baking tray. I use a broad plastic scraper to help level it out. Bake for 15minute, or until it feels firm when you press the surface. Take it out of oven and if the top is uneven, press down the surface with a metal serving spoon. Leave it in the tray, cooling it on a rack for 10minutes. For the topping, melt all the ingredients except the almonds and cream in a saucepan and bring to the boil. Then remove the pan from the heat and stir in the cream until it is combined. 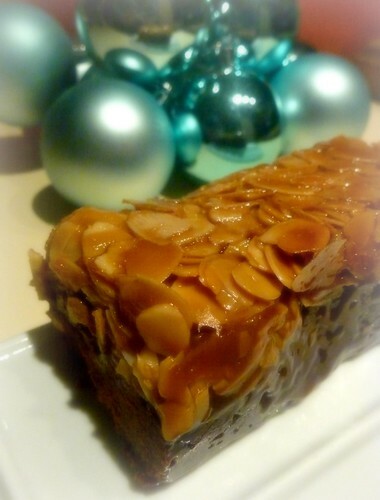 Spread the almonds generously and evenly over the surface of the base. Pour the caramel evenly over the top. Sprinkle the surface lightly with a little salt and place the tray back into the oven for 20 minutes. By this stake your home will smell divine. Allow the slice to cool before removing it from the tray, slicing into squares or fingers. It's quite a rich treat, so please go easy on the eating!